Life's a Journey...Add the Sparkle! TO CELEBRATE, MIMI'S SPRING SPECIAL OFFER IS FREE DOMESTIC SHIPPING FOR ALL ORDERS OF $50 OR MORE. STAY CONNECTED AND NEVER MISS OUT ON A ONE OF A KIND ITEM! I love this bracelet so much. I am certainly not waiting until July 4th to wear it! Thank you so much for the quick delivery! Make a wish ... or send a wish to someone special! Pewter and goldstone necklace with Swarovski crystal accents. In the shop and ready to ship! 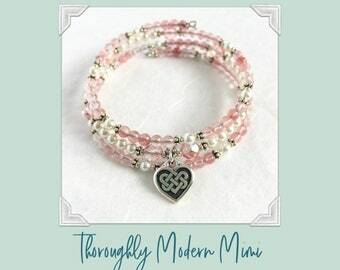 Perfect pairing for a wedding party gift...Mother’s Day...First Communion...or Confirmation. Minimalist silver or gold cross with a single Swarovski crystal birthstone. Available in two sizes and chain lengths. Keep it simple with a handcrafted copper pendant on a link chain. The warm tones of antiqued copper and hand painted butterfly would make a lovely gift for Easter or Mother’s Day! My shop name, Thoroughly Modern Mimi, comes from my grandsons, who call me "Mimi", and my love of musical theater. Like most home based artists, I work in the space that is available. An unneeded bedroom works just fine! Although I have worked with many different art mediums, painting with acrylics and watercolors is my favorite. I learned calligraphy as a school girl many years ago and had left it behind until I discovered brush lettering. My work, whether a painting or a new jewelry design, is often inspired by nature...or a quote by a favorite artist. Artist...Designer...Photographer...Blogger...What's not to love about this life! I've been an artist and crafter since I was a teenager, mostly creating gifts for friends and loved ones and wearable art for myself. As I inched closer to retiring from a life-long career in education, I came to realize that I'm not cut out for a life of golf outings and luncheons! Over time, I've turned a small spare bedroom into a studio, which is now filled with supplies for drawing and painting, jewelry making, and working with yarn and fabric. Friends and family members have often said that I should consider turning my artistic hobby into a home-based business. My hubby has even suggested that this might be a good way to pay for all the beads, fabric, yarn, and paints that I find so irresistible! In 2015, I did just that, opening Thoroughly Modern Mimi as an outlet for my jewelry creations. After a lengthy hiatus to sort out my plans for retirement in June, 2017, I've returned to the shop with fresh ideas and a new look. My own favorite pieces to wear are the ones that remind me of special events in my life...gifts from friends...vacation memories from galleries and museums...repurposed beads and charms from my college years. 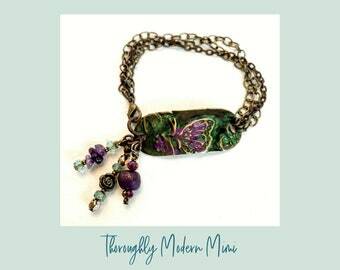 The pieces I create for Thoroughly Modern Mimi are a reflection of those treasured times and what started out as simple origami earrings has morphed into semi-precious natural gemstones, Swarovski crystals, and hand-embossed metals. Whether you're looking for the perfect gift for someone special, or a unique piece for yourself, check out the latest collections in my shop! I am a former elementary/middle school art teacher who now has plenty of time to fuel my passion for creating wearable art! My Etsy shop first opened in 2015, but went on hiatus during 2016, while I transitioned to my new life as a full-time artist. Hello and welcome! I have always enjoyed wearing unique jewelry and accessories, especially items that are handmade. The items listed in my shop are all designed and handcrafted by me using a variety of materials, some new, some vintage, and some reclaimed from pieces that been unloved for far too long. My shop prices reflect the quality and availability of the materials I use, but every item is handcrafted with the same amount of care and attention to detail. All jewelry items (earrings, bracelets, necklaces) will arrive packaged attractively for gift-giving. Packaging will vary with the seasons and availability of materials, but your purchase will always be "dressed to impress"! I take great pride in my work, but if you are not delighted with your purchase, I will accept returns within 30 days of the receipt of the goods, as long as the item is returned unused and/or unworn, and in the original packaging. Please contact me within 14 days of purchase to let me know that the return will be on the way: charmaine [!at] cboggsart.com. NOTE: I am unable to accept returns on pierced earrings, as these are considered "intimate items" for health/hygiene reasons. I am also unable to accept returns on custom or personalized designs. I will refund your purchase price, but regret that I cannot refund shipping charges. Return shipping is also your responsibility. Use a trackable, insured shipping method and contact me prior to shipping either through Etsy conversation or through my business email: charmaine [!at] cboggsart.com. Your purchase money will be refunded upon receipt of the item/items, provided they are received in a timely manner, unused/unworn, and in the original gift packaging. Payment can be made using PayPal, credit card, or Etsy gift card. After your payment is confirmed, I will ship your purchase via USPS First Class mail within 1-3 business days, unless some unforeseen event delays my visit to the post office. Should that happen, I will do my best to contact you to let you know of the delay. Please be sure your shipping address is up to date and accurate. I am not responsible for shipping errors due to inaccurate shipping information on your part. When you place your order, you will have the option to upgrade your shipping to Priority Mail for an additional fee of $7.50 for one item and $2.00 for each additional item. Your order will automatically be moved to the top of my "to do" list and will generally ship out within 1-2 business days. NOTE: PRIORITY SHIPPING WILL BE THE ONLY OPTION AVAILABLE AFTER DECEMBER 14, 2018. Custom designs require an additional 1-2 weeks for processing BEFORE the items are shipped. TO GUARANTEE CHRISTMAS DELIVERY FOR 2018, ALL CUSTOM ORDERS MUST BE PLACED ON OR BEFORE FRIDAY, DECEMBER 7, 2018. COPYRIGHT 2018: Artwork, photographs, and listing images are my personal property, and as such may not be reproduced, blogged, or used without my permission. Permission to Pin on Pinterest is granted, provided the pin is directly linked to my Etsy shop page. Social media sharing, with mention of my shop, is also permitted...and appreciated! When your make a purchase from Thoroughly Modern Mimi, your payment will be processed through Etsy's payment services. I will not have access to your credit card information. For information about Etsy's payment process, please click this link to the Etsy policies and terms of service: https://www.etsy.com/legal/privacy/. I will only have access to the information that you provide when you place your order: your full name, mailing address for delivery, and your method of payment (but not the credit card information). You may choose to provide your personal email, however, I will always contact you via Etsy Conversation. I will never add your email to my email list with MailChimp unless you choose to provide it by linking to the "subscribe" page. If you do subscribe, you may unsubscribe at any time by clicking the link at the bottom of any email from Thoroughly Modern Mimi. I am always willing to work with clients on custom orders. If you like my designs, but need a different size, color, or material, send me a message. I do my best to respond within 24 hours to let you know if I can accommodate your request. Some of the stones and metals used in my jewelry designs require special cleaning and storage to prevent scratching or chipping of the stones or discoloration of the metal. You will receive written information with your jewelry when it arrives. 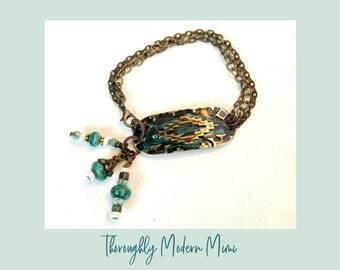 Every purchase from Thoroughly Modern Mimi arrives ready for gift-giving. This also ensures the safe delivery of the jewelry to your address.